How to Make the Best Stuffed Mushrooms Ever! Put the 'fun' in fungi with these handy tricks that'll make your meatless Monday a real treat! For those of you don't already know, thick portobello mushrooms are an excellent vehicle for hearty fillings. They cook down into an umami flavor bomb all by themselves, and happily absorb additional seasoning as well, like soy sauce or a simple sprinkle of salt and pepper. Cleaning and preparing your mushrooms may seem intimidating for those who've never attempted it, but it's a very quick, approachable process; after which, you can fill your 'shrooms with just about anything your heart desires (or anything you want to clear out of your fridge or pantry!). Below is a handy guide for first-time mushroom-stuffers. Already a pro? 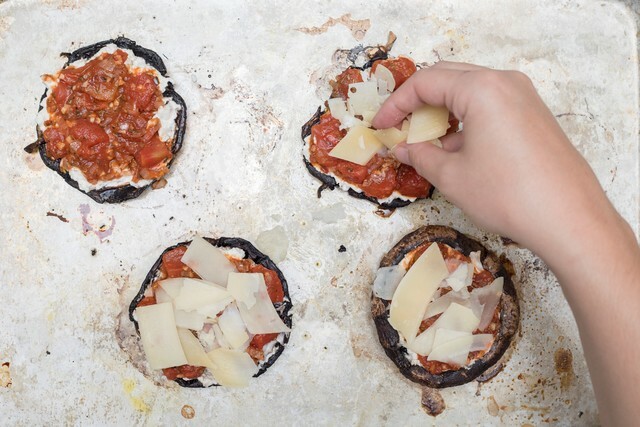 Scroll down for a bonus recipe for your next stuffed mushroom adventure! Most of your filling will end up just about anywhere but the inside of your mushroom if you pick up a carton of too-small, too-flimsy specimens. Shoot for caps that are at least two to three inches in diameter - keep in mind that they may shrink a little while cooking - and be sure that they're thick and sturdy enough to take on your filling, especially if you intend them to be portable or eaten sans silverware. Larger caps are perfect for entree-sized portions that both vegetarians and omnivores will crave come dinnertime. Mushrooms are very absorbent, so many advise not to run them under water as it dilutes their flavor; instead wipe them down with a damp towel to remove any stray dust and dirt before moving forward with preparation. However, if you prefer to rinse your mushrooms thoroughly, be our guest! It won't "ruin" your lovely 'shrooms at all - just be sure to dry them thoroughly as well! ...but don't nix it entirely! After you remove the stem from your mushroom (it usually pops right off with your fingers, but you can use a knife if it's being stubborn) finely chop and add it to your filling mixture. It'll blend right in, echoing the savory flavors of your mushroom cap, and you'll feel good knowing that you avoided unnecessary food waste. Wahoo! Tossed with a zesty tomato sauce and topped with plenty of melty cheese, this Italian-style vegetarian supper is satisfying and sumptuous. 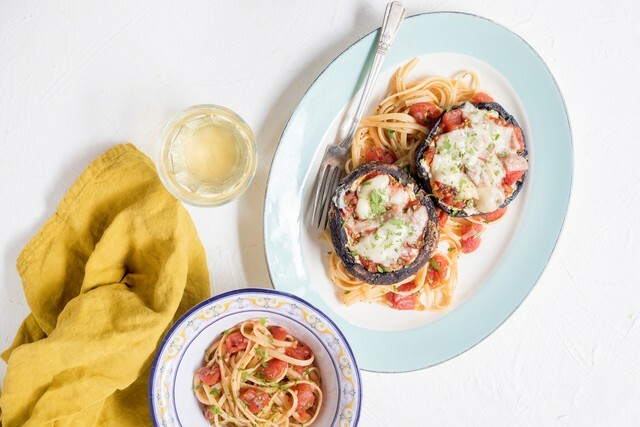 A juicy portobello mushroom is perfect for soaking up savory flavors like a sponge, and stuffing each cap with goat cheese and allowing them to bake away in a hot oven while you prepare the rest of the meal rewards you with tantalizing aromas and even tastier flavors. They’re placed over linguine tossed with a chunky spiced tomato sauce, so get your pasta-twirling forks ready—you’re in for a tasty treat! 1. Heat oven to 400° F. Bring a saucepan half full with salted water to a boil. Add pasta and cook, stirring occasionally, until pasta is tender but not mushy - about 7 minutes. Drain pasta and set aside. 2. On a baking sheet, brush mushrooms on all sides with a total 1 tablespoon olive oil. Arrange on sheet gill-side up. Bake in oven until liquid begins to pool in the center of each cap, about 10 minutes. Flip mushrooms. Bake until tender - about 5 minutes. Remove from oven and let cool slightly. 3. Place a small saucepan over medium-high heat. Add shallot and garlic. Cook, stirring, until shallot begins to become translucent - about 2 minutes. Add tomato, Italian herbs, red pepper, 1/2 teaspoon kosher salt and 1/4 teaspoon black pepper. Cook until sauce has slightly thickened, about 3 minutes. 4. Flip mushrooms on baking sheet and fill each cap with goat cheese. Top with half of tomato ragu and Parmesan. Bake in oven until cheese melts and begins to become golden - about 5 minutes. Remove from oven. 5. Toss pasta with remaining tomato ragu. Divide between 2 plates.Top with stuffed mushrooms. Garnish with parsley, and enjoy! Pssst! This recipe and all the ingredients you need can be delivered right to your door next week when you order by Sunday, November 3rd!